In celebration of Canada Day, the Peel Archives is highlighting a group of records whose very existence speaks to our cherished status as a free and democratic country: municipal council records. Peel’s citizens are actively encouraged to come in to review these fascinating and informative records! County of Peel and Region of Peel councils from 1897, 1919, 1959, and 1987. 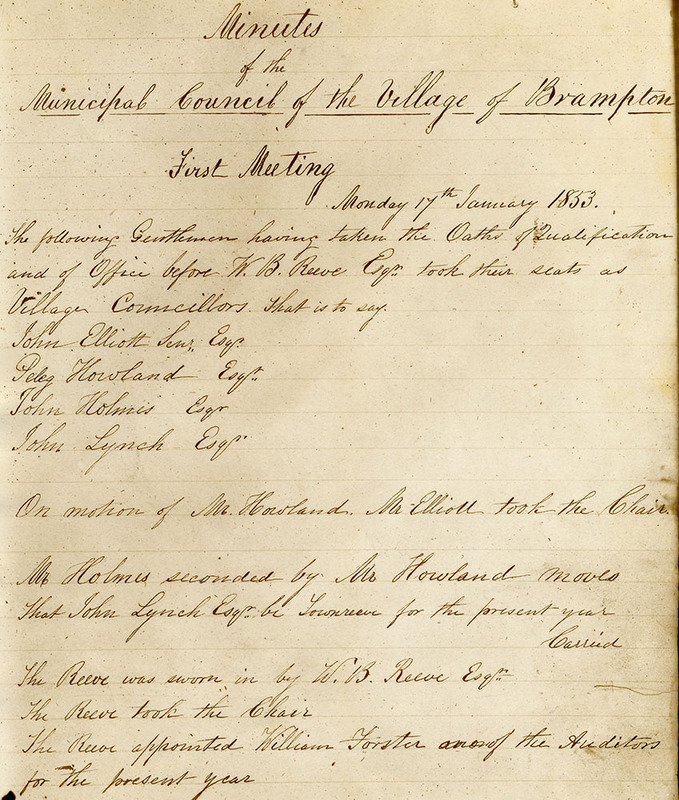 The Peel Archives is the official archival repository for the council and committee records of the Region of Peel, as well as the area municipalities of Mississauga, Brampton, and Caledon. 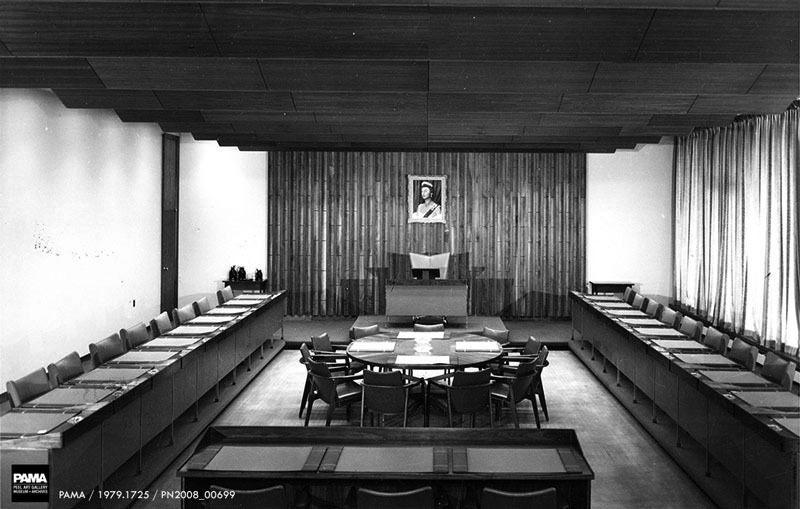 The councils themselves are composed of elected representatives, now known as councillors, who meet regularly to discuss, debate, and make decisions concerning the administration and governance of their respective municipalities. To that end, each council assigns work to various committees, allowing councillors on those committees to review in detail specific topics or issues. Committee mandates and composition differ by municipality, but most councils tend to establish a core set of committees, including administration-finance, planning, public works, and health/human services. Ad-hoc and special committees will also often be struck in order to look into specific or time sensitive issues, including, among other things, strategic planning, waste management, and emergency planning. The records generated by councils and their committees contain a range of record types, including meeting agendas and minutes, reports, submissions to council (including petitions and proposals), and correspondence. The Clerk of each municipality manages these records before they are transferred to the Archives. These records document the activities and decisions of area councils and their respective committees. Preserving and making these records available to the public ensures that citizens are able to exercise their democratic right to learn about and scrutinize the actions of the government. 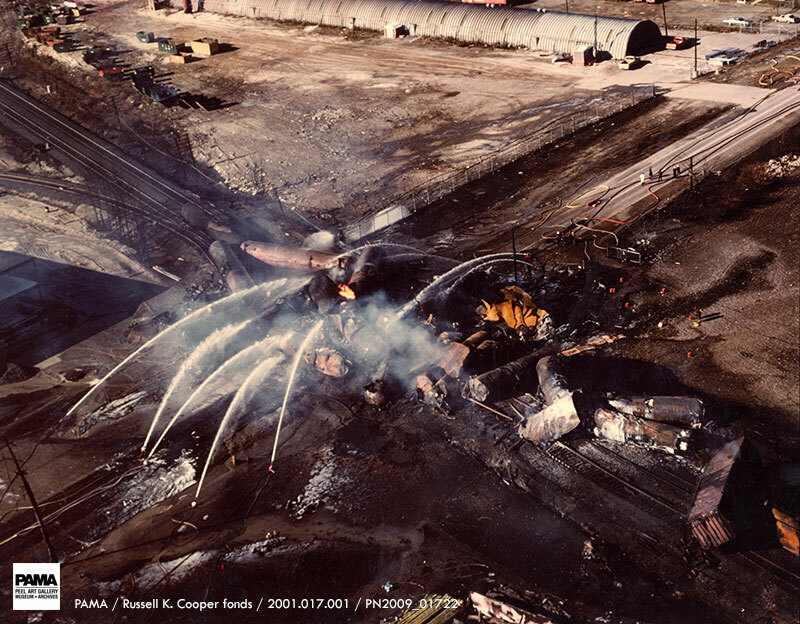 On November 10, 1979 a freight train carrying poisonous and explosive chemicals derailed near the intersection of Mavis Road and Dundas Street in the City of Mississauga. What followed was at the time the l argest peacetime evacuation in North American history. Reports found among the Peel council records shed light on the ways in which the City of Mississauga, the Region of Peel, and the Province of Ontario worked together in the aftermath of the derailment to ensure that the site was thoroughly cleaned and decontaminated. 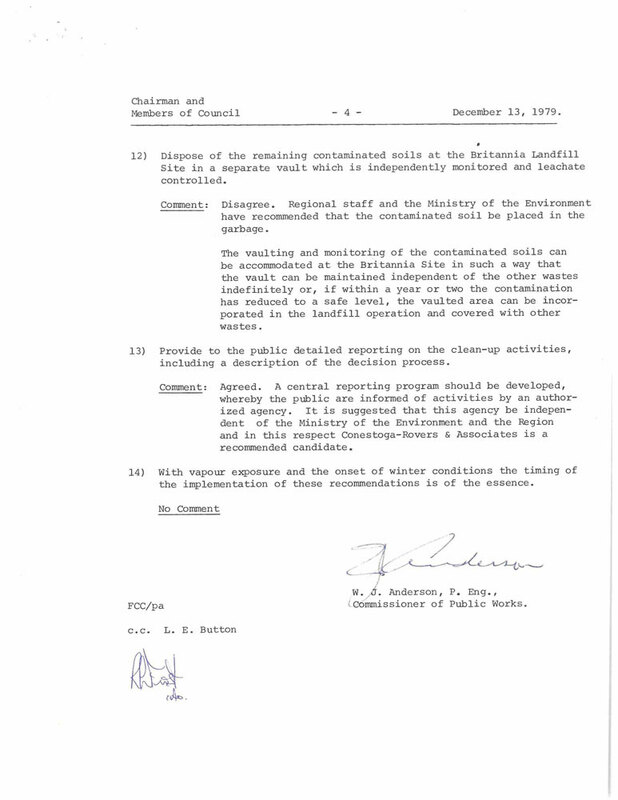 A December 1979 report documents the Region of Peel’s point-by-point response to the planned rehabilitation of the derailment site. 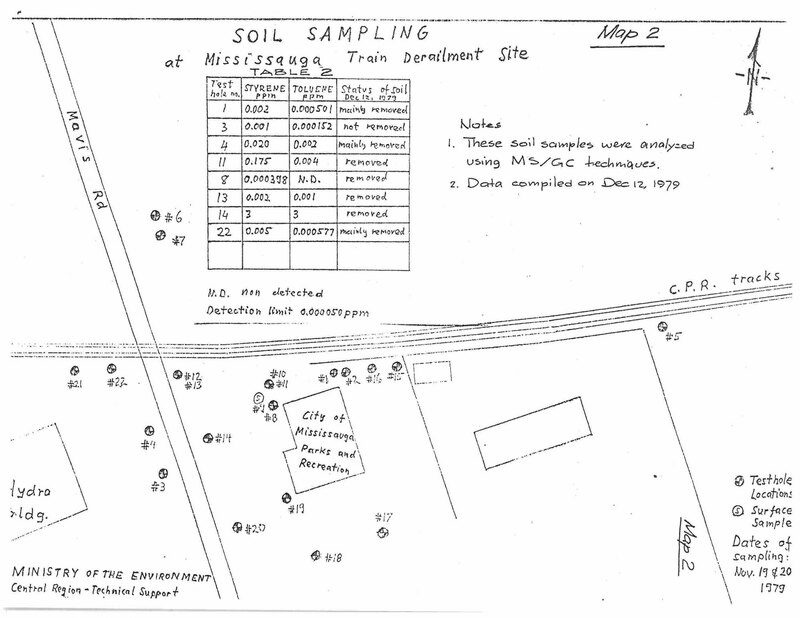 It also includes a map of all of the soil sites tested by the Ministry of the Environment. 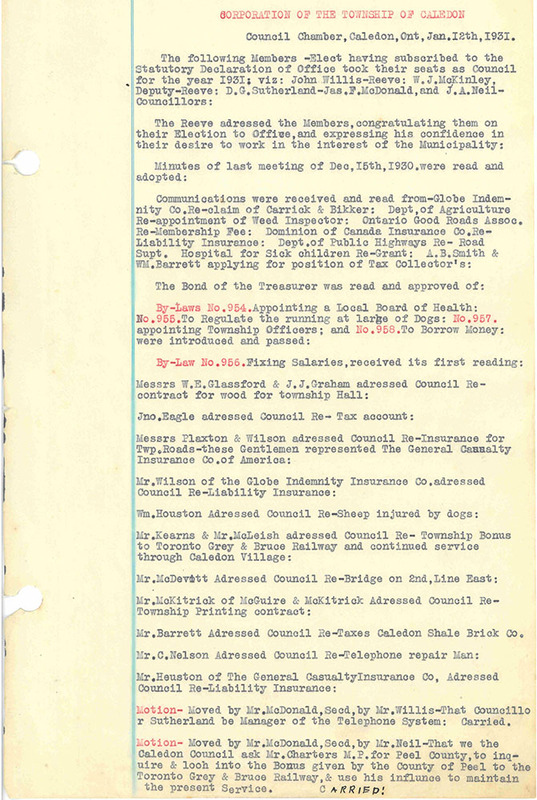 The Peel Archives holds the surviving council records of all of the area municipalities and their predecessors. In 1973 there were 11 incorporated municipalities in the area overseen by their own councils; by 1974 they had been amalgamated into four – the Region of Peel, the City of Mississauga, the City of Brampton, and the Town of Caledon. Some council records are available on microfilm and can therefore be scanned to a USB disk by researchers (the Reading Room is equipped with two digital microfilm scanners). Typed versions of the Region of Peel council minutes are available through the Region of Peel’s website. The original minutes and all of the supporting records are kept in archival storage. The Peel Archives adheres to the Municipal Freedom of Information and Protection of Privacy Act (MFIPPA). This legislation is designed to facilitate the widest possible public access to government records, while also ensuring that any personal or sensitive information is protected. Generally speaking, council and committee records tend to be open with no restrictions. However, if any personal or sensitive third party information is found during processing, the file(s) will need to be reviewed by an archivist before they can be released.